There’s a generational shift going on, and it’s changing how businesses approach their sales and marketing strategies. Radical differences between these generations in terms of values, expectations and behaviors make this epic shift a unique challenge for marketers. Are you ready to adapt? 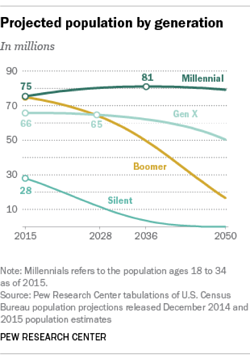 Millennials (ages 18-34) are the nation’s largest generation with 75.4 million individuals in the United States. By comparison, Baby Boomers (ages 51-69) now number 74.9 million and Gen X (ages 35-50) number 52 million. Millennials shop to “show who I am,” striving to connect to likeminded people. They have high expectations, and authenticity is very important, as they rely heavily on recommendations. Millennials have a lot of spending power by sheer numbers, but have a lot of debt to consider (think student loans), so value is very important. Generation X may be sandwiched between two giants, but are established with spending power. According to Open Forum, 10% of all Gen Xers are considered “upscale” with a household income of over $250,000. Xers are practical and the last generation to have experienced life prior to the technological boom, remembering “pre-smart phone days.” At the forefront of change, they have driven the development of technology. Since 2008’s economic downturn, Baby Boomers are less flush with disposable income than you would think. Retirement, kids’ education and other financial concerns make Boomers apt to invest in products and experiences that help them feel fulfilled. Industry experts say currently only 12% of buyers meet a sales rep in person at the beginning of the buying process. Regardless of generation, buyers spend much time pre-sale researching online. Imagine all of the touches your potential customer is missing at various stages of the sales funnel if you don’t have a good digital presence. If you’re not found as they search, you won’t be considered when they are ready to purchase. Aligning your marketing efforts with the sales team will yield you the most effective messaging. Every good sales person has the stories they tell in order to work their way through the sales process with every audience. Marketers should harness those stories to create content for each phase of the sales funnel. In addition, team members can leverage this knowledge for some pretty impactful account based marketing. Do they Trust you? Are you Valuable? It’s important to segment your marketing efforts to appeal to various audiences with relevant and targeted content. Providing value and creating relationships, regardless of the generation, should be paramount in your marketing strategies. Be short, to the point and (above all) valuable, and you will build the trust that most buyers require. Reviewing the Inbound Marketing Methodology will help here. Generally, sales and marketing alignment means your marketing strategies can adapt to the generational shift. Set your company apart as solutions-oriented and gain meaningful relationships with your customers by contacting Ironmark’s digital marketing team for more on how to line up your digital marketing strategy with your sales efforts.